The importance of web developers in this technological age that we are in cannot be over-emphasized. This is because the majority of human activities today is being carried out on the website today. The web has offered to some individuals many opportunities ranging from starting up business to developing and growing communities that have shaped human existence. Closely linked with the services of web developers, are that of web designers who help in building and designing internet pages. This no doubt, has mainly contributed to the increase of online presence globally. In this article, we shall be looking at 10 ways the services of an Indian web developer can be helpful to you. With many e-commerce business springing up on a daily basis, there is no doubt that increased competition in that sphere. To stand out among other e-commerce businesses, the services of a web developer is needed. An e-commerce developer in India can not only help in providing you and your business with the best e-commerce web design but also go extra mile to provide you with other helpful features on your online store that will help grow your business. It might be that you own a corporate website for your business and are looking to make it look different from that of other companies. In other words, you are looking for your website redesign. In either of the cases, you need services of a reliable web developer. Be it a Drupal developer or a Magento developer, you are sure to have them provide you with a highly professional corporate website that is easily navigable by your everyday users. In doing this, these web designers from India can bring in their years and wealth of experience to the practice. WooCommerce is one of the best e-commerce WordPress plugins that can help you to setup your e-commerce website quickly & cost-effectively. However, to make your WooCommerce site look professional by maximizing all the appropriate plugins made available, and also integrate external plugins, you will need the service of an experience website developer or a WordPress developer in India. An Indian WooCommerce developer can help you to develop your online store at affordable price. Just like WooCommerce, Magento is also a well-known e-commerce platform globally. With a high level of flexibility and performance, a Magento developer in India can help you build a sophisticated Magento e-commerce website that maximizes the rich features & user-friendly interface of Magento thereby simplifying content marketing and advertising. OpenCart is a PHP and MySQL based tool that is very necessary for e-commerce. An Indian OpenCart developer can help in making use of this tool to enhance your website’s search option, product friendliness and the interaction of customers daily with products and services being offered by your online e-commerce business. Just like WordPress, Drupal is another popular CMS platforms available to build a website efficiently. This platform has gained ground amongst educational and governmental institutions. However this widespread use, this tool can still be used by small businesses. With the help of a Drupal developer in India, the responsiveness and scalability of this platform can be well harnessed for increased business productivity. The technological world is an ever-changing one, and for any online business to survive amidst these changes, the services of an e-commerce developer are very much needed to consistently help in redesigning your website to be sure you’re taking advantage of these changes to increase traffic and engagement with your business. In the course of making use of a website, specific issues might arise that will affect the overall functionality of the web page as a whole. These issues need to be addressed technically to avoid loss of data and/or information. A web developer in India can help fix and re-fix websites in the most convenient & affordable way possible without causing any damage to it. It is always essential for individuals, businesses and companies to note that beyond creating a website, is maintaining it. Indian website developers are skilled in the art of website maintenance ensuring that your business never lags behind as they continuously see to the upgrading of the website by introducing more innovative features to it on a timely basis. 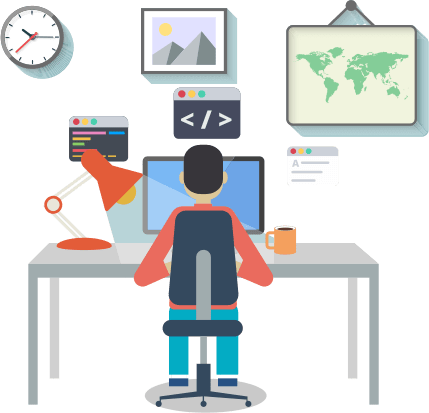 There is an increased collaboration of web developers with custom PHP developers to better create more interactive websites where the working team of every site is able to relate with users and interact with them in the course of making use of the platform. So, if you are looking for a PHP website development, you can hire Indian PHP developers who can help you to build your websites and complex web applications at affordable price. There is always more to the services offered by a web developer than what you think. It is however important that Indian web developers and web designers are well maximized to ensure your website is rich in content and user-friendly as well.